P125W Waterproof Pocketherm Folding Thermometer from Comark, it’s fast, it folds, it bleeps, it’s waterproof! Neat, Pocket Digital for quick checks on frozen, chilled or cooked food. This version also comes complete with a Certificate of Calibration (+5°C and +70°C). 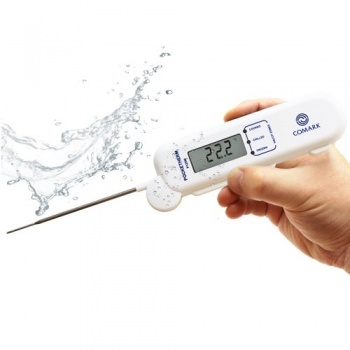 The Comark P125W/CAL Food Thermometer is suitable for both air and product temperature measurement and provides excellent accuracy. It is certified to European Standard EN13485:2002 making it particularly suitable for use anywhere in the cold chain. Rated IP65, the thermometer is the perfect choice for demanding process environments. The P125W/CAL incorporates a range of advanced features designed to answer the quality control and HACCP requirements of the professional food industry user.